Not sure this even requires comment. Chandler's new City Hall comes with some features that have municipal workers and visitors scratching their heads. 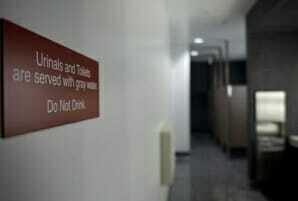 Like the restroom signs that tell people not to drink out of the urinals and toilets. A few employees have been cracking jokes and speculating about what it would take to make them slurp from potties when water fountains and sinks are a few feet away. "I'm glad that I saw that sign because I was very thirsty and looking for a means to quench my thirst," Mayor Boyd Dunn quipped. "Seriously, I'm certain there's some regulation out there that requires that type of sign."